The Layers of Meaning in Levitus | Watts Up With That? This week I got to ruminating about this graphic, and a number of similar graphics I’d seen. And yesterday I realized that it wasn’t showing what I thought it was showing. Let me illustrate what I mean. I’ll start with an overview of the oceanic heat content (OHC) of the three layers that are provided by NOAA. These cover 0-100, 0-700, and 0-2000 metres depth. Figure 2 shows that data. Figure 2. Annual changes in oceanic heat content for the 0-100, 0-700, and 0-2000 metre layers. Now, my problem was that when I looked at graphs like Figures 1 & 2, I thought that the deepest layer was gaining heat the fastest. And there’s been a lot of discussion about how that could be, and much speculation about the reason for the big increase in the deeper layers from 2001 onwards. But yesterday I thought hey, wait a minute … those layers of the ocean overlap! They are not separate layers, they all extend to the surface. So what we’re seeing in the deep 2000 metre level data is to some extent affected by what’s happening in the other levels. Yeah, I know, I should have seen it earlier, but I’m not gonna pretend. The good news is that we’re measuring ocean heat content (OHC), so it’s very different from temperature. We can simply subtract the changes in the 700 metre level OHC from the 2000 metre level OHC changes, and what is left is the change in heat content for the layer from 700 metres down to 2000 metres. Can’t do that with temperature. Figure 3 shows the same OHC data as in Figure 2, except split out into distinct and separate layers, at the same scale. as Figure 2. Figure 3. 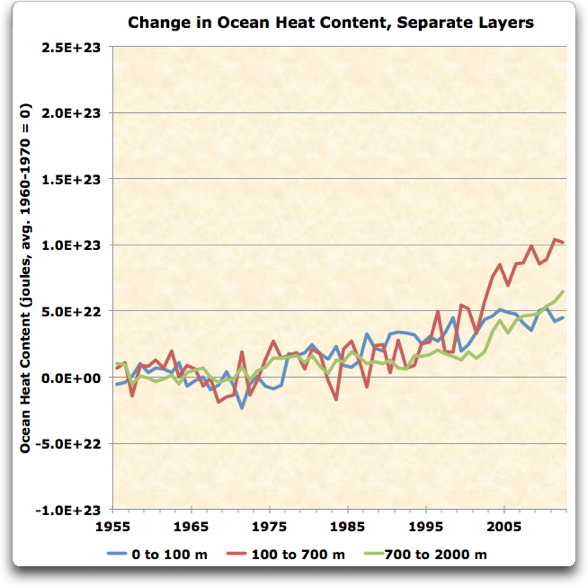 Changes in oceanic heat content. The exact same data was used as in Figure 2, except it was split into three separate layers rather than three overlapping layers. I was quite surprised by this result. Once I split the information up so that I could see the changes in each of the layers separately, much of the apparent change post-2001 disappeared. In Figure 2 there’s not a lot of change in 2001. I also found it interesting that for most of the time covered by the study, all three layers picked up about the same amount of heat. Only in the last decade has the middle layer (100-700 m) picked up a bit more heat than the other two layers. I hadn’t expected them to warm and cool generally in unison as we see above. Finally, I calculated the change in temperature for each of the levels. The nice thing about the ocean is that the temperature and heat content are mathematically related by the fact that it takes about 4 megajoules to warm a tonne of water by 1°C. This lets us convert from heat content to temperature and back as needed. Remember that the three layers have very different volumes. So a terajoule of energy added to the shallow 0-100 metre layer will warm it more than the same terajoule of energy added to the more voluminous 700-2000 metre layer. Fortunately, NOAA also provided the ocean depths on a 1° x 1° grid, so we can calculate the volume of each of the layers. Once we know the volumes, we can calculate the temperature changes. Figure 4 shows the same data as in Figure 3, except expressed as a temperature change rather than as a change in heat content. Figure 4. Measurements of ocean temperatures at the surface and three sub-surface layers. There are several interesting things about this plot of the temperature measurements. First, as one might hope, we have relatively good agreement between the sea surface temperature (SST) and topmost layer (0-100 m). However, the annual and inter-annual swings in the upper 100 metres are larger than those at the surface … which seems somewhat strange to me. I’d have expected the surface to change more than the bulk. Next, as we’d expect, the nearer to the surface, the greater the changes in temperature. Finally, I’ve marked the eruptions of El Chichon and Pinatubo for future reference. I’ll come back to this in a subsequent post. For now, note that there is no visible effect of the volcanoes on any of the five different measurements of ocean temperatures. As near as we can tell from these measurements, the effect of the volcanoes on the ocean was below the limit of detection. So … now that we have had a better overview of what’s happening to the various layers under the sea, are the changes in ocean heat content surprising? I’d say not particularly. Yes, the middle layer (100-700 m) started warming in 1995. And yes, the lower layer (700-2000 m) followed suit starting in about 2001. But neither of these seem particularly surprising. I don’t have any explanation for them, but they do not seem to be unusual. It is possible, for example, that they represent the sub-surface changes associated with the gradual shift of the Pacific Decadal Oscillation from the positive to the negative phase. We know very little about the ocean depths, including how much we’d expect them to vary. And the records are short, too short to even show two PDO changes. It is clear, however, that the changes in heat content are not caused by CO2, at least directly. Finally, we have to consider that the changes in the deeper layers may be an artifact. One obvious possible source is the integration of the Argo data into the Levitus analysis. The first Argo floats went in during the early nineties, and were added progressively over the next two decades. It is at least conceivable that some or all of the recent changes in the deeper layers are an artifact of the change in measuring methods. The data is from NOAA , except the ERSST and HadISST data, which are from KNMI. The NOAA ocean depth data is here. The R code to extract and calculate the volumes for the various Levitus layers is here. Fig 2 and 3 y-axis: 5.0E and -5.0E should read 0.5E and -0.5E. My mistake. I see the exponent for the 5.0 is 22 and not 23. At the same time the expansion of the scale of the y-axis outside the central bands is visually very misleading. So if I’m right in interpreting your diagrams, each of the layers follows the trends in global temperature with an increasing lag and decreasing sensitivity dependent on depth. So in future we can expect to see 0-100m temps go down, whilst lower depths continue to rise before falling again somewhere around the mid-century period. Am I correct in observing that there are sharp troughs in the 0-100m temperature anomaly and that these troughs coincide with El Nino events? If so, can I ask if the temperature anomaly rise (that is the extra heat) in the air at that time is balanced? All that can be ruled out if the heat balances. One observation from your figure 3: it seem like the two deeper layers are in sync (which is a little surprising to me but seems clear enough) however, the 0-100m layer seems to have a lead of about 3 years over the other two. This could be assessed more accurately by cross-correlation preferably on annual data not pentads of course. The phase lag would be a useful parameter to extract in relation to things like Hansen ‘in the pipe line’ warming claims. Your suggestion of bias due to Argo seems important. There does not seem to be a physical explanation for where the heat could come from to cause a substantial rise in 100-700m without 0-100m rising. Little solar energy can penetrate that deep before getting absorbed. That this anomaly occurs in the period where Argo starts to come in does point a finger. Why is deep ocean water cold in the first place? Anybody? No, they coincide with La Nina events. El Nino is warming both the ocean and the atmosphere. Now the comparison of pre ARGO and post ARGO mass deployment data is probably open for a lot of Winston Smith-style history rewritings; but the interesting thing is the misleading “layering” used by the government agencies with the N in their name. Not at all sure I’d agree with that. There is a quite significant drop in 0-100m OHC after El Chichon, that could be interpreted as oceans compensating for loss of solar input with climate feedbacks acting so as to correct the deficiency. You have posted a lot on your ‘governor’ idea, this may be a manifestation of just that sort of negative feedback. Mt Pinatubo is less clear but there is a less drop and then of course the huge dip caused by 1998 El Nino. I’m a little surprised not to see a more obvious positive excursion for SST around 1998 but that may well be an artefact of these damn running means again. In your last thread I pointed out how they were inverting precisely that event. I _strongly_ suggest any closer look at changes on the sub-decadal time-scale is done with a non distorting filter on the annual data, otherwise you will end up discussing the aberrations caused by the filter and not what the data does. Since both the shallow OHC and SST is available with higher resolution , that is obviously the way to go. This is well worth looking at since, if what I have suggested is happening (climate governor compensating for volcanoes) then the major excuse for exaggerating CO2 with hypothetical +ve feedbacks disappears. I’ve been suggesting this for a couple of years. And if climate can handle a major stratospheric eruption, there a damn good chance it can counteract a slow gradual increase in CO2. There’s at least one published paper that shows an increased likelihood of El Nino a couple of years after major eruptions. Some of Bob Tisdale’s plots of basin by basin changes in SST and OHC would also support this idea if only he would stop ‘detrending’ SST without explaining where that energy went. My impression is that 8 to 10 years after a major eruption, the climate has compensated and the net result is near zero. To that extent, I would agree with your statement but I don’t think volcanoes are undetectable on the annual scale. Following eruptions, winters are milder , summers cooler, OHC compensates for lost solar input. Initial cooling of SST is followed by more or less equal warming period and La Nina recovers OHC lost to compensate earlier Ninos. That’s a rough sketch and may not fit exactly but I think that is closer than the official line of exaggerated volcanic cooling compensated for by exaggerated CO2 warming. On model which has blatantly failed in the first decade with negligible volcanic activity. Willis said, “As near as we can tell from these measurements, the effect of the volcanoes on the ocean was below the limit of detection.” More like barely at the level of detection. I was comparing the lower stratosphere by hemisphere with OHC trying to make a quick Black body shell example. With the lags between hemispheres, you can separate regionally to follow the volcanic aerosol impact. That and a buck will get you a cup of coffee, but it is kind of neat how useful the satellite data is. Capt. Dallas, that plot of stratosphere tends to beck up my previous post. The stratosphere also shows a similar rebound after each volcanic event before falling back to a lower ‘steady state’. This shows that climate is reactive and not just sitting back waiting for the dust to settle. Official line is just that. There is a few years where ash/aerosols etc block sun and it eventually fades away. Such data show that premise to be incorrect and that climate has a reactive response to such events. That a layer of water 2000m deep will take up more heat than a layer 700m deep, methinks. Density. And remember, sea water has highest density at freezing point (that is: near -2° C) and not at +4° C like destilled water. The cold water on the ocean floors is the result from freezing sea-ice nearing wintertime. Sea-ice is sweet water; while forming cold currents of brine drop down to the bottom to gradually spread out over the entire oceanfloor. Further reading: thermohaline circulation. I wonder what would happen if these heat content numbers were expressed as joules/meter cubed? Which has the larger volume – 0-100 meters, 100 – 700 or 700 -2000. I’d suspect the 100-700 but I don’t know. I like the way you think, simplify things and clearly articulate & illustrate your findings. Well done! You should have indicated the three volumes: 0-100, 100-700 & 700-2,000 and converted that to mass, compensating for density due to temperatures. I think that will clearly illustrate & justify the heat transfer lag times. Do we have any credible knowledge about deep ocean currents below 700 meters? I would assume the “mixing” in the varicous layers varies greatly. Greg Goodman, of course it is reactive. Most of the albedo, clouds/snow, is response driven. If you want to avoid all the noise, then you go back to the radiant physics basics, black body cavity and radiant “shell”. That response of the stratosphere to the deep ocean heat content is perfectly predictable. Right, so the troughs are La Nina events then. Does the slight uptick in the 100-700m range account for that heat then or is the heat going somewhere else? Of course, the deeper ocean has more thermal capacity than the tinnere upper layer. The heat budget change still seems worthy of investigation as those negative peaks are so clear. Are they showing the transport of heat down to the depths? Or are they showing transport of heat elsewhere? If La Nina’s can move Trenberth’s missing heat downwards then it is missing no more. All that’s left to do is to work out how man is causing La Ninas and we would be able to get published. Looking at this again, that was incorrect. Figure 4 shows temp of surface laying is warmer, so there’s no contradiction with heat energy increasing in 100-700m faster than surface layer. Heat is being lost from surface layer to 100-700m at the same time as heat in coming in from solar. That would seem to be about in balance since 2003, so middle layer is warming while surface layer 0-100m is remaining fairly constant. Until we understand how the cumulative, say fifty years, of Solar activity affects the Trade Winds and the Indonesian bulge, and then understand how the Pacific Ocean currents move from the bulge, we will not understand how the Pacific Ocean is heated at depth. As per the “experts”, [paraphrase] “it is not well understood how the surface currents merge with the deep currents”. Remember the deep oceans are not static, they are in motion. The only static areas are in the North/South Pacific Gyres and the Southern Atlantic Gyre. But, as the Sun moves to the Tropic of Cancer or the Tropic of Capricorn, these areas move. Why doesn’t the NOAA research the “Hot Indonesian Bulge”, I’m sure they can get monies if they say it could be causing “Climate Change” due to “Global Warming” due to “CO2” from “Man”. Interesting, looking at figure 4, surface and 0-100 m begin their rise somewhere around 1976-8, then the 100-700 m begins its rise around 1994, then the deeper layer begins rising around 2002-2004. It seems to me that would indicate that there is a time constant delay and the ocean layering in the models are 1) too simple of a layer structure, and 2) too short a time constant for the energy transfer. It looks as though the 100-700 m layer lags the surface to 100 m layer by about 15 years, and the 700-2000 m layer lags it by almost 10 years. This indicates a very complex energy transport that simply isn’t reflected in the models. I recognize that there is not enough time in the time-series to really say a whole heck of a lot about “climate” from this as the good deep data is only about 10 years long. We haven’t even begun to see all the cycles in this data. Then there is the whole notion of someone “adjusting” the data to match climatology that will pervert the whole time-series. We also have virtually no coverage of the deep areas under the polar sea ice, what exactly is happening up there? 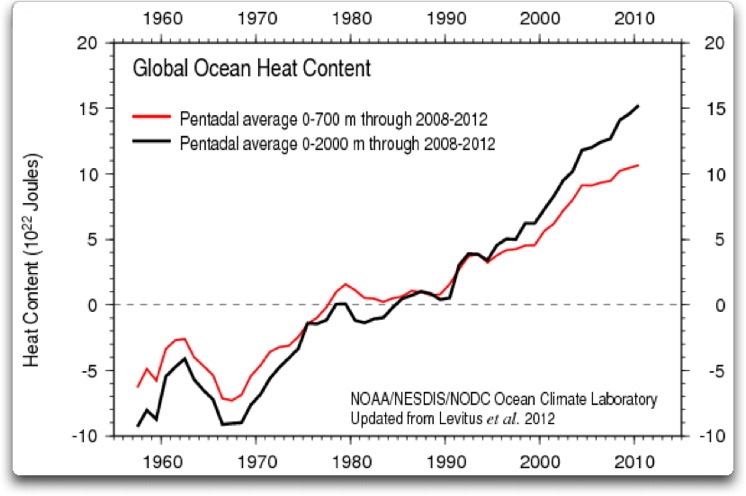 A number that is almost never reported is the total heat content of the oceans, rather than the change. The oceans contain about 1.3×10^18 tons of water. Each ton has been heated from -273C to 0C, giving 2.7×10^8 J/ton. The heat of fusion to melt it gives another 3.3×10^8 J/ton. Ignoring the additional 4C rise gives total heat content of about 6×10^8 J/ton. That gives a total heat content in the oceans of about 7.8×10^26 J. The 5×10^22 J anomaly over the last 55 years for the majority of the ocean volume is a change of about 64 parts per million in total heat content. Just how reliable are the pre-Argo OHC measurements given how little of the ocean was sampled? Aren’t those figures just so much WAG, especially those for depths down to 2000 m? – Most of the energy ‘generated’ by an El Nino is sent to space. So, where can I find XBT- only OHC data covering at least up to 2005? I noticed you used 1960-1970 for base years. They help to show how the data diverge with time, which is great. FYI, if you had used 1955 to 2010 for example, you’d also note in a comparison like your Figure 2 how the 0-700 meter and 0-2000 meter data align themselves from 1970 to 2003 and then diverge once the ARGO floats are in place. The NCDC still has lots of work to do with that dataset. chris y: Regarding your May 10, 2013 at 6:48 am comment, I’d like to suggest that you write it up, add some more detail and present it as a guest post to Anthony. This was a “well, duh!” moment for me. I, too, had not seen the overlap in layers. As soon as I read your opening lines, I had a pretty good idea of what to expect when you plot the data in a more meaningful fashion. I look at data all day everyday and should have seen the problem a long time ago. Thanks for making my AHA! OHC makes a lot more sense to me now. You’re assuming, of course, that the data below the surface prior to the ARGO era has any value (keep in mind it’s been adjusted beyond recognition) and that the increase around 2002-2004 in the deeper layer isn’t an artifact of the additional coverage with, and the adjustments to, the ARGO data. Pochas: water is odd in that it gets more dense as it cools, up to about 4C, then it starts to get less dense. So water at around 4C sinks to the bottom. Water from melting ice at the poles will continually feed the depths. The actual temperature for maximum density depends upon the salt content, its ~4C for pure water. cRR Kampen: “Density. And remember, sea water has highest density at freezing point (that is: near -2° C) and not at +4° C like destilled water. And so, shouldn’t this be the first place to look when trying to assess changes in heat content of cold deep ocean water? Specifically, wouldn’t a decrease in the amplitude of the circumpolar freeze/thaw cycle affect the inflow of cold deep ocean water into the reservoirs? And in theory CO2 does have most of its effect at high latitudes, by reducing cooling rates. The bottom of oceans is filled by the densest, cool water – therefore, from a certain depth down the temperature should never change. Do we know what that “certain” depth is? Is it near 2000 m? The graphs are plotted for “oceans”. Is it only for areas of oceans that are at least 2000 m deep, or does it include continental shelves as well? The sun is not heating the interior of the earth. The interior of the earth is hot because of radioactive decay. (It would have long since cooled from gravitational heating.) Can we assume that heat flow from the center of the earth out is uniform and constant in space and time? Anyone? References? I believe your second question answers the first. It’s paywalled but this presentation seems to contain the relevant information. It describes a mechanism for centennial variability in the antarctic/Southern Oceans which impacts heat content of global oceans at depth. In 1975 a maximum was reached in the amount of very cold Antarctic Bottom Water being produced and since then this has declined (and looks likely to continue for several decades if the mechanism is right). This would suggest the apparent warming at depth maybe due to a weakening of the impact of this cold water. It’s worth reading all this because midway it starts to explain the impact this variability has on the position of AABW and NADW. And in the conclusion seems to suggest the impact is felt at mid depth (below 1000m). Maybe you could repeat your analysis for the different ocean basins to see whether it is the Atlantic that is mainly contributing to these trends? Yes, overlapping ranges confuse the issue and create an illusion to infuse life into the “missing heat” monster. Thanks for the prompt and thoughtful analysis. Something pros like Trenberth should have done before starting to politick. The adjustments to ARGO have me scratching my head. I don’t see anything in the engineering documents for ARGO that would indicate the system should have a cold bias, but someone adjusted it to correct for that. That someone needs to have a serious, introspective look at their integrity, because this looks like making changes to experimentally collected data for the purpose of supporting ones hypothesis. I was always told that was a punishable error worthy of having all ones papers pulled and grants withdrawn. Apparently, that does not apply in Climate Science(tm). If they suspect some units are reporting bad data, they should go collect those units, bring them back to the lab, and check their calibration! If the calibration is good then there is no need to make adjustments, but if the calibration is bad, remove that unit’s readings from the series! You have to assume the data is good until you have actually, physically verified a malfunction. As to the old bucket and drop sensors, I concur that they were too few and too sparse to give anything like an accurate look into what was going on at depth. There is a definite apples to comets comparison going on in deep ocean analysis. My point in the first point was a bit of a dig at the paper that was reported on WUWT a few months ago that showed a climate model that modeled the ocean as a two tiered reservoir with a rather fast time constant. This data (if it has any validity at all) seems to indicate that the ocean heat transport model is far more complicated. I would suggest that even these 3 layers are inadequate and probably need to be broken up farther and compared, but without getting to the raw ARGO data and doing some very laborious rebinning into ever smaller delta depth/pressure/density segments, then checking the time delays, that hypothesis could not be tested. @David in Texas: The average flow of heat from the Earth’s interior is estimated at 70 mW per square meter. It is not uniform in space nor in time – volcanoes, hot spots. I don’t know how accurate that estimate is. Thanks for the note of encouragement! I don’t know if there is enough to justify a complete post. I’ll think it over. By the way, I’ve thoroughly enjoyed your e-book “Who Turned on the Heat?”. Very enjoyable reading with lots of drawings. The first thing the relative energy content of shallow and deep data suggest to me is that the data AS CREATED is flawed, i.e. the conversion of Argo temp-salinity to energy is incorrect. Because we are not graphing data but calculations involving data. The second is that we are seeing a natural cycle in how the oceans transferr heat that is outside of conventional understanding. We know that the oceans overrturn, so that surface waters eventually go deep and deep come to the surface. Our understanding is that this takes a long time, perhaps 300 years. Perhaps we are serriously wrong, We also think that the overturning is a continuous process; again, perhaps we are wrong and the overrturning is cyclic and sudden. If overturning can be or is fast and sudden, it would explain swift temp changes globally explained by neither CO2-atmospheric circulation models nor solar-cloud theories. The third is that we are looking at the merging of two datasets that shouldn’t be merged, the Argo and the pre-Argo data. Again, calculations and not data: it could be the original data sources are not actually sampling the same though they appear to be. This is anotherr Trenberth Event, a Positive TE: a deep heating that is bypassing the shallow that should not be seen but is. It actually has caused a Negative TE: we should be seeing more of a shallow heating than we are. The TE response is interresting because together the explanations are contradictory: not seeing what was modeled, the shallow heating, is taken to mean not that the models are inadequate or flawed, but that we are being “tricked” by nature. Seeing what was not modelled, the deep heating, means the models are not inadequate or flawed, but that they are VINDICATED by other yet-unknown means. Nature is reassuring us that we are right to be worried. Trenberth Events are extraordinary events that reveal our social need to be certain and “right”, a need that taps into an extraordinary ability to find rationalizations where justifications are missing. As I looked at the graphs I could see the heat gained from the 1999-2001 La Niña. It first warmed the 0-100 depth and proceeded downward. It would be interesting to investigate OHC changes vs. the ENSO (La Niña) index to see if that changes over time. Might produce some interesting insights. For example, if a La Niña warms the oceans and we see more of them during a negative PDO then we should see an overall warming of the oceans. However, since most of this data was collected during the positive PDO phase it seems counterintuitive. Thanks, Chris, you raise good points. I get slightly different numbers, though. Sea water has a specific heat of about 4 megajoules per tonne. So to raise a tonne of water from -273 to 0°C require 273 * 4e+6, or 10.9e+8 joules. You give this as 2.7e+8 joules. Also, the Levitus data contains the total volume of the ocean. They have it at 1.56e+9 cubic km, where you are using the canonical value I’ve used for years, 1.3e+18 cubic metres. In addition, you have to increase this by about 3.3% to get tonnes, so the total weight of the ocean is 1.62e18, about 25% larger than the figure you give. So at the end, I get a heat content of 1.62e+18 tonnes times 10.9e+8 tonnes, or 1.8e+27. This is about 2.3 times the value you obtained. However, that’s just the math. Your point is correct. We are talking about very small changes in OHC. I’m not sure how relevant that is or what that might imply, however. I’ll have to think this over. It seems to me that measuring the heat content of the overall oceans in general is a very coarse measurement which doesn’t really tell you a whole lot. I would think more informative measures would be the layered heat content in upwelling and downwelling areas separately. That tells you how much heat is being carried down, and how much is coming up. The blow up shows that in 0-300m there is a change of 3 measured units and in the 0-700m, there are 7.5 units. Thus, 4.5 units represent 300-700m. Hence, the rate of warming is greater in the colder body than the warmer body. Thank, cRR. This is a common misconception which others have repeated above. At the pressure and salinity at the ocean bottom, sea water continues to get denser all the way down, and is densest at freezing (which as you point out is a couple degrees below zero because of the salinity). A very astute question. Because the Argo floats ‘hibernate” below1000 m for about 90% of their cycle, that corals the Argo floats preferentially into deep water. So shallow seas must be undersampled by consequence. Also isolated deep water seas with choke points could be undersampled or oversampled because entry or escape is hindered. I made comments on the areas I thought undersampled and oversampled, with the hypothesis that water depth and sub sea barriers were in part to blame. Could you be more explicit as to where the values of “0 to 100m ” OHC data shown in your figure 2 can be found? The Levitus data includes a variety of measurements—ships sea-surface temperatures, XBTs, TAO buoys, oceanographic data, Argo floats, and everything else. As a result, they do indeed include the continental shelves. Stephen, you are correct that the Argo floats generally sample waters that are at least 1000 metres deep, because that’s where they sleep. However, they can be set to sleep shallower. Various nations operate groups of Argo floats. The Japanese use them to sample the Sea of Japan, much of which is less than 1000 metres, and I assume that they just set them to sleep at a shallower depth. You are both correct that the exact locations of under- and over-sampling are important, and I’ve discussed that a bit in some of my earlier posts. For example, the Inter Tropical Convergence Zone tends to be undersampled. Having said all of that, the Argo data is amazingly detailed and interesting, and there is still lots and lots to learn from it. I’ve barely scratched the surface of it, literally, because all I’ve looked at so far is the Argo SST data. According to a detailed analysis by Cotello et al in Environ. Sci. Technol, 2010, the voiume of the world oceans is 1,335,819,297 cubic km. Not that I believe it can be measured with that accuracy! I’m not sure where your 1.56e+9 cubic km figure is to be found in the Levitus data or papers? The Barker et al 2011 paper “Pressure Sensor Drifts in Argo and Their Impacts” is quite interesting on this issue ( here – full paper paywalled, but available on request at http://ecite.utas.edu.au/76152 . The problem seems to be more with drfit in pressure, and therefore depth, measurement than with temperature measurement per se. Their statement that “A uniform depth error of 5 dbar globally produces a temperature bias that is greater than the observed ocean warming during the past 50 yr in the tropical and subtropical ocean and equals almost half of the observed warming in the higher latitudes when averaging between 0 and 300 m” is pretty shattering. That is a depth error of only 5 m, if I’ve got my units right. Willis, kudos for comparing OHC (Joules) to temperature. Numbers such as 5*10^22 Joules looks enormous, but Joule is so humanly intangible a quantity on such an enormous object that the number is literally academic. To get a better mental handle on the problem, I like to keep a couple of parameters in mind. 1 ZettaJoule = 1 ZJ = 1*10^21 Joules. [Willis:]So, assuming there are no problems with my math, they are claiming that they can measure the temperature rise of the top mile of the global ocean to within 0.004°C per year. That seems way too small an error to me. Willis’ Figure 2, shows 200 ZJ added to the 0-2000 meter ocean volume from 1955 to 2013. So that should be only 0.07 deg C. However, by the same chart, only 50 ZJ of heat are shown to have accumulated 0-2000m since the start of ARGO in 2003, which equates to less than 0.02 deg C, or 0.002 deg C/yr, even if you believe the precision of the measurement of ARGO worldwide averages. Comment about Figure 4: Perhaps the most important events to mark on the chart are not volcanic eruptions but the start and end of the ARGO float constellation growth. Prior to 1/2 of the ARGO constellation launched, the amount of heat added below 700 m is pure “by-guess-and-by-golly”. Frankly, we are looking at another “Hockey Stick” with undersampled, noisy data from 1955-2006(?) being given magnitudes more weight than they deserve compared to recent data. Realistic error bars need to be put on all the Levitus point data. I expect error bars prior to 1980 to exceed the top and bottom margins of the chart. Thanks, Nic. Yes, I know that the usual value is on the order of 1.3 billion, which is why I was surprised by their figures. The data and the code for the calculations, done in R, are at the end of the head post. Perhaps a bit more explanation is in order. Levitus gives the minimum depth for each 1° x 1° gridcell. Using R, I calculated the area by layer, adjusting for the area of each gridcell, then multiplied by the layer thickness, and summed them. More on: I expect error bars prior to 1980 to exceed the top and bottom margins of the chart. Who really believes we knew the average temperature of the world’s 700-2000 m oceans to +/- 0.1 deg C? That is, without the assumption that the deep water temperature doesn’t change from year to year. If we did, how could anyone justify the cost of ARGO to get the precision down to 0.004 deg C per year? So let’s assume that we did have a precision of +/- 0.1 deg C.
or 150% of the size of the Y-axis in Figure 2. Thanks for checking my calculations. I erred in using 1 J/gmC instead of the correct 4 J/gmC for the heat capacity. With this correction, I arrive at the same result as you (if I use your ocean volume estimate). Shouldn’t the specific heat capacity of ice be used from -273 to -2? Interesting. But where are the error bars for all these measurments? Does anyone seriously consider that there is sufficient confidence in the accuracy of this data to make analysis a worthwhile objective, especially given the shortness of the data set which is rendered worse by the material changes that have taken place in the methodolgy of taking the measurements? (i) Most Argo Data Assembly Centers (DACs) have not yet corrected APEX profile data for the drift of pressure sensors in real-time (RT) and delayed-mode (DM) files. Steps are being taken by the DACs to apply drift corrections in both RT and DM files. It is estimated the correction will change affected APEX float pressures by an array average of about -2 dbar in 2003 data, decreasing to about 0 dbar in 2008 (due to improved sensor stability). However, a few older individual floats may have profiles with pressure offsets of over 10db. …..[……]…. (2) Quartz transducer now used with electronic instruments. The accuracy is 3 dbar and the precision is 0.5 dbar. Accuracy – ability to measure compared with an absolute standard. Precision – ability to measure consistently within a given data set (variance in the measurement itself due to instrument noise). I think this data set is rubbish and I wonder, why nobody has noticed. I refer in particular to figure 2 and the exceptional massive, massive increase (about 1.0 E23) around 2003 in a very short period of time for the 0-2000 heat content. Such an increase of total ocean energy can only be explained by A) massive decrease in cloud cover B) gigantic underwater volcano activity. A) did not happen as well. so that increase is nothing but an error. Very detailed discussion of pressure drift and the effects of on ocean heat content in Kobayashi And Johnson: (good graphics in this paper) but it dates back to 2007 and discusses Argo floats deployed as of 2003. Float CTD sensors are subject to calibration drift after laboratory calibration. With a target of an average 4-year lifetime untended in the ocean, the potential for sensor calibration drift is significant. Argo DMQC work first focused on conductivity sensor drift, because it was thought that calibration drift of this sensor could be the largest. With a lot careful work on this topic, systems have been built, and are being refined, for assessing and correcting those drifts statistically. These systems generally exploit the relative stability of the T-S relationship. Little has been done to detect subtle (not obvious from visual inspection by an experienced researcher) temperature sensor calibration drift. The way forward on such detection, should it be needed, is not clear. Temperature sensors are thought to be sufficiently stable to meet Argo accuracy targets even with typical calibration drift over a 4-year lifetime. Recently DMQC attention has turned to pressure. The “actual” warming signals estimated by Levitus et al. (2005) show large variations for each ocean, more warming occurs in the Atlantic and less in the Pacific. The warming signal observed in the Pacific is about 0.1 °C for the upper 300m water column during this 50-years, which may make it very difficult to assess climate changes in the Pacific by the current Argo Project, in which there are many profiles with pressure drift. This calculation gives an upper limit on the size of the effect because not all pressure sensors are biased. However, considering the history of Argo Project, the situation appears quite serious. 1. Among the major 3 types of Argo floats (APEX, PROVOR, and SOLO), only APEX still needs additional operation for pressure drift adjustments. However, it is likely that earlier versions of the PROVOR and SOLO floats both had problematic pressure sensors and did not effect this correction automatically. 2. Large pressure sensor drifts (more than5 dbar) are found in Paine and Ametek 1030pressure sensors, which were used for Argo floats with equipped with SeaBird CTDs before 2003. For floats deployed during and after 2003, the pressure sensors for SeaBird CTDs were changed to those made by Druck, in which drift is usually within 1 dbar (Figs. 4-5). All floats equipped with Falmouth Scientific Instruments CTDs used Druck pressure sensors (W. B.Owens, personal communication, 2007). 3. In 2003, the Argo array was still largely a collection of regional arrays, not a global one, and there were many regions devoid offloats. In addition, many regions were occupied by floats of a single country or PI (Fig. 13). water is odd in that it gets more dense as it cools, up to about 4C, then it starts to get less dense. So water at around 4C sinks to the bottom. Water from melting ice at the poles will continually feed the depths. Freshwater density is 999 kg/m^3. Typical densities for seawater are only slightly higher: 1020 to 1050 kg/m^3, with most of this range being due to pressure. The range of densities at the sea surface is about 1020 to 1029 kg/m^3. The freezing point of seawater is lower than that of freshwater. As sea water freezes, it forms pockets of salt. The salt (brine) leaches out of the bottom of the ice and the brine drips into the water below the ice. Thus sea ice when melted is considerably fresher than the original water which was frozen. The “brine rejection” process creates dense water below the sea ice formation area. This can be an important contributor to dense water formation in a global sense as the densest waters are formed at high latitudes, and often involve sea ice. The faster that sea ice is frozen, the less likely that the salt can escape. Thus the saltiest sea ice is formed at the lowest temperatures. Sverdrup et al. (1942 text) tabulate the salinity of ice formed from water which starts at salinity 30. When frozen at an air temperature of -16C, the salinity of the ice is 5.6. When frozen at an air temperature of -40C, the salinity of the ice is 10.2. Global ocean surface is 361 E12 m2. 2 years have 63 E6 seconds. = 4.4 W /m2 in the 2 years around 2003. 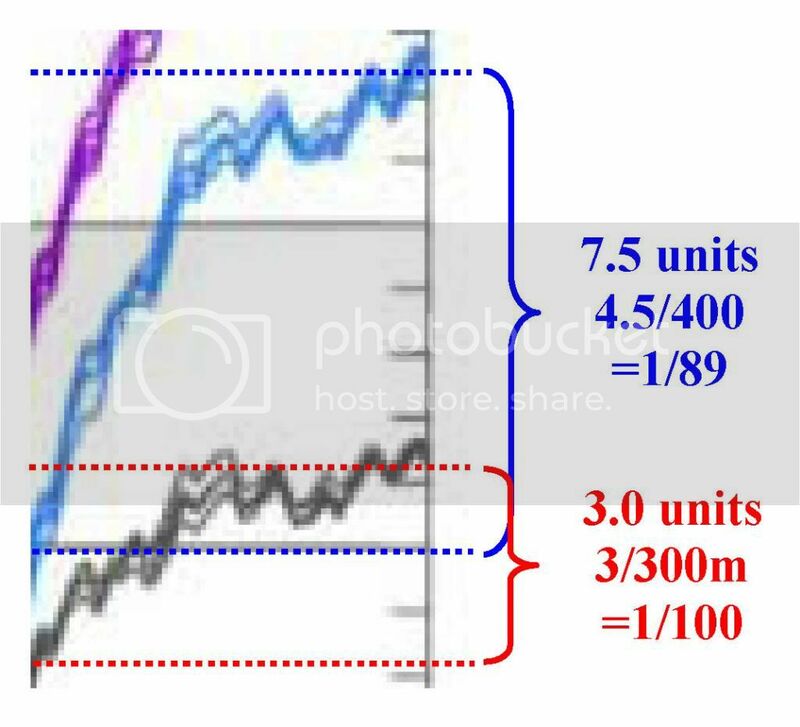 Compare this with with the IPCC AR4 estimate of ocean heat uptake of 0.2 W/m2. There is no way that oceans took up as much heat in 2 years around 2003 as in all other years between 1970-2010 combined (see figure 2). It’s not quite that bad, Manfred, because it’s over three years and not two. But still, I get an imbalance of 2.8 W/m2 maintained over three years, which as you point out seems … well … less than likely. However, we’re a long ways from understanding the vagaries of the ocean and the clouds. And it doesn’t take much change in the clouds to give us 2.8 W/m2 … maintaining it over three years, though, that seems unlikely. Willis, thanks again for an interesting article. Question: what if we are looking at this upside-down… from the human perspective (breathing air, walking on land, etc.) the deep ocean is a mystery. So we tend to think “top-down” as in the air is causing some effect on the oceans… What if the earth lithosphere below the ocean is really driving the recorded ocean heat content? Has anyone done actual measurements of the lithosphere heat content and change in that heat over time? Obviously this is not a scaled analog of the planet, and you can a wide variety of other inputs like heat lamp (Sun), but it’s fun to consider. If that data would be true, it would mean that half of the warming of the last 40 years happened in just 3 years. Somehow greenhouse gases “conspired” during this ARGO installation period, and opened a massive cloud window. And I write massive.cloud window, because in AR4, a total forcing of 1.6W/m2 translated into an ocean heat uptake of 0.2 W/m2. Wouldn’t then 2.8 W/m2 heat uptake require a cloud cover forcing increase of 25.4 W/m2 ? Like you, I doubt that rise after 2001. As I said in the head post, I strongly suspect it to be an artifact of the addition of the Argo floats to the data. Willis, Why doubt the rise after 2001? You should investigate the rise after 2001. Thanks to MSU data, you have a satellite era global wattmeter. You can compare “global” response, volcanic, with internal redistribution, the 1998/99 regime change. I doubt it is accurate enough to get hard numbers, but it is a good gut check. I would imagine that, with the flat-lining of the global temperature averages since 1997, and Trenberth’s, “We can’t explain where the missing heat has gone to” (paraphrased), this finding of yours would give him grist for his mill: The heat went into the 100-700 later! Univ. of N. Dakota, Int’l Heat Flow Commission with a valuable Marine data map. The vast majority of marine data points are listed as < 0.1 W/m^2. So to get even 0.5 W/m2 for the ocean in general would require huge heat flow from the rifts that I don’t think is there in the data. I had my D’OH moment between figs 1 & 2 & then read on to have you confirm what had just clicked in my meagre brain. 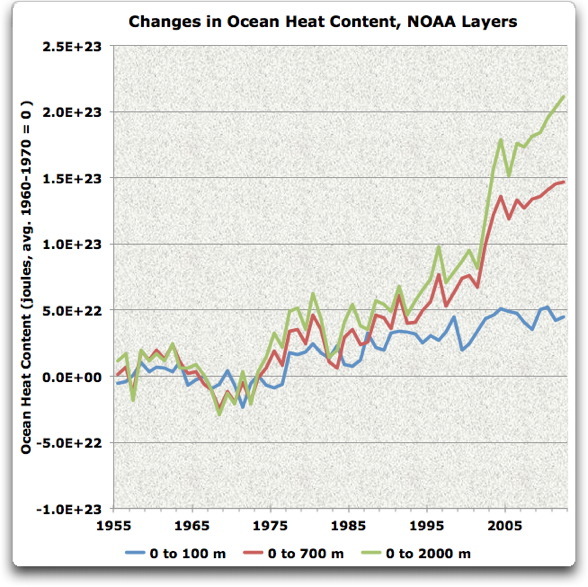 The oceans are simply exhibiting delayed response to the observed warming at the surface. Warm the surface of the ocean and the deeper layers will also warm … after a delay. Nothing mysterious about that. And from the graphs we can even estimate the size of the delay. 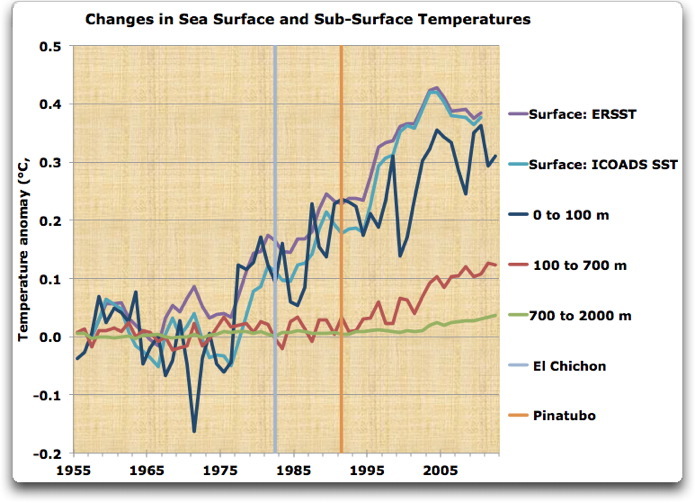 The sea surface started warming in 1977 and peaked in 2003. It has been declining since then. The mid ocean layers didn’t start to move until 1995 exhibiting a delay of around 18 years. I’d expect the temperature in this layer to therefore peak in 2021 and then decline. The deep ocean didn’t start to respond to the 1977 warming event until 2003 and thus appears delayed by about 26 years. I’d therefore expect this layer to continue to warm until 2029 before it starts to decline. All this seems completely expected and nothing to get too excited about. Your workings seem to assume that the extra heat was being applied 24 hours a day. Surely that wouldn’t be the case. At night the ocean must give up heat. The discrepancy in the record looks ever more likely to be unfeasible even over three years.